Lt. R.S. Yegerlehner (MC) U.S.N.R. Hello Junior – Nothing new in medical staff, still intact except three promotions – Andy, Cath & myself as you can see by return address. Well – by today you should have arrived and I imagine it was a momentous day when you set foot on U.S. continent. We were all thinking about you and several of us have gone so far as to say we miss “Yegie.” Maybe, I’ll be seeing you soon. Your laundry was sent as promised and you should get it by ’45. My extracurricular activities have not been deterred, am playing golf as much as ever but not better. Received 18 golf balls (12 were reprocessed – just like new). 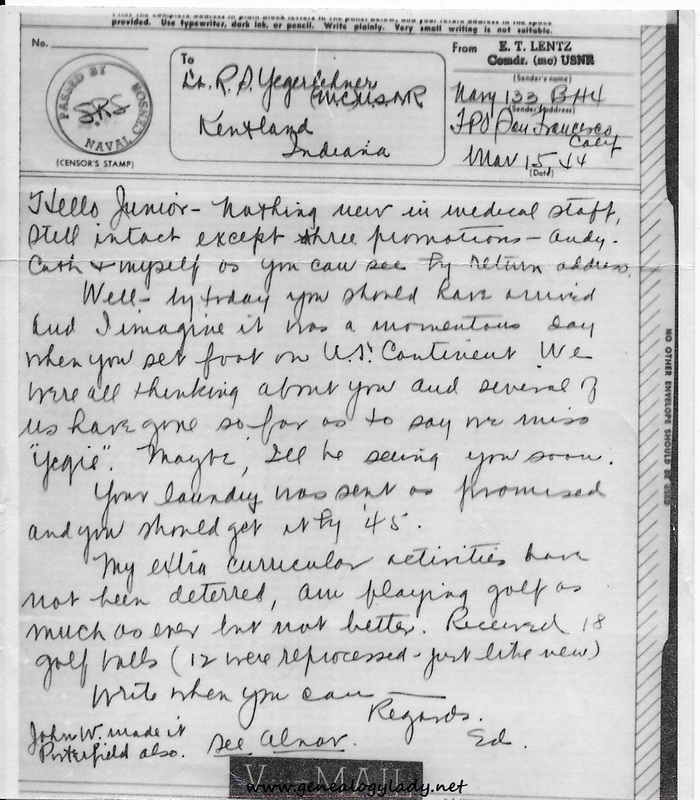 This entry was posted in Foster, Genealogy, World War II, World War II Letters, Yegerlehner and tagged ALNAV, Dr. Edmund T. Lentz, Dr. Marvin H. Porterfield, Edward D. Anderson, Edward P. Cathcart, Medical Corp, Navy 133, Navy Base Hospital #4, Roscoe S. Yegerlehner, United States Naval Reserve, World War II, World War II letters on January 19, 2016 by Deborah Sweeney.